When it comes to desserts, I can eat pretty much everything. Actually I could live only on two foods – beef and desserts. Those traditional sweet rice cakes called Kyong-dan 경단 have been in my head for 2 days, until I finally decided to make them. The recipe I found seemed to be very easy, but of course my nearby Asian grocery store had to disappoint me. 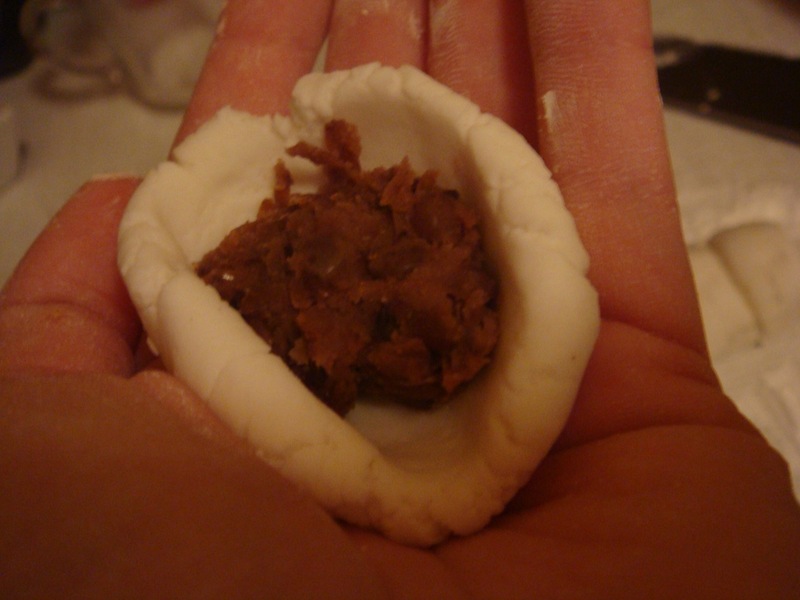 No soy bean powder, no mugwort powder and no sweet rice flour. I read that plain rice flour is less stickier, but despite that I decided to try Kyong-dan on this one. I had no choice. What is a Kyong-dan? It’s a rice cake ball, boiled in water and then coated with different colored powders. It can be stuffed with sweet filling. As powder, you can use everything that’s on your mind, from sesame seeds, cinnamon, chestnuts or even cake crumb. The reason that I picked white and black sesame is because I love its taste. First let’s make a filling. Mine was a sweet red bean paste. I took a cup of washed red beans and boiled it in 4 cups of water for about an hour. 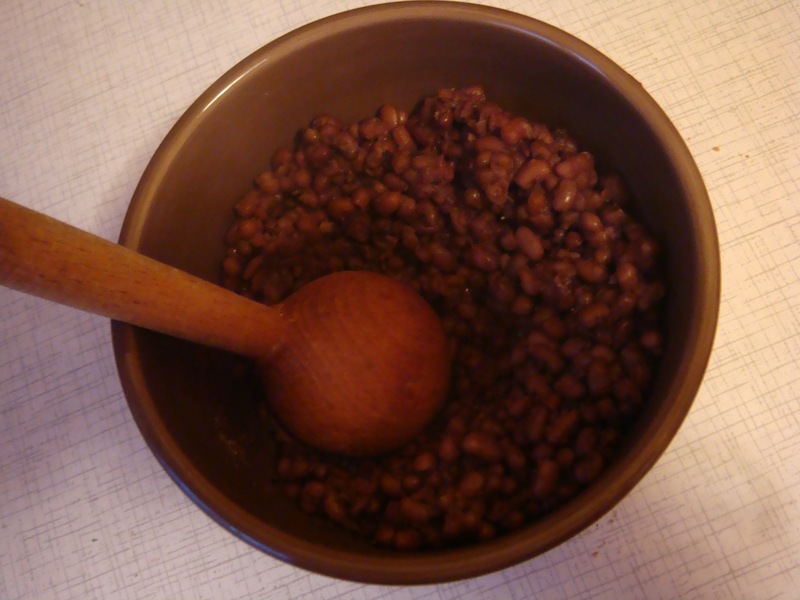 When the beans were fully cooked, I removed an extra water, added a cup of sugar, one teaspoon of salt and one of cinnamon powder, and crashed the bean with a wooden spoon. 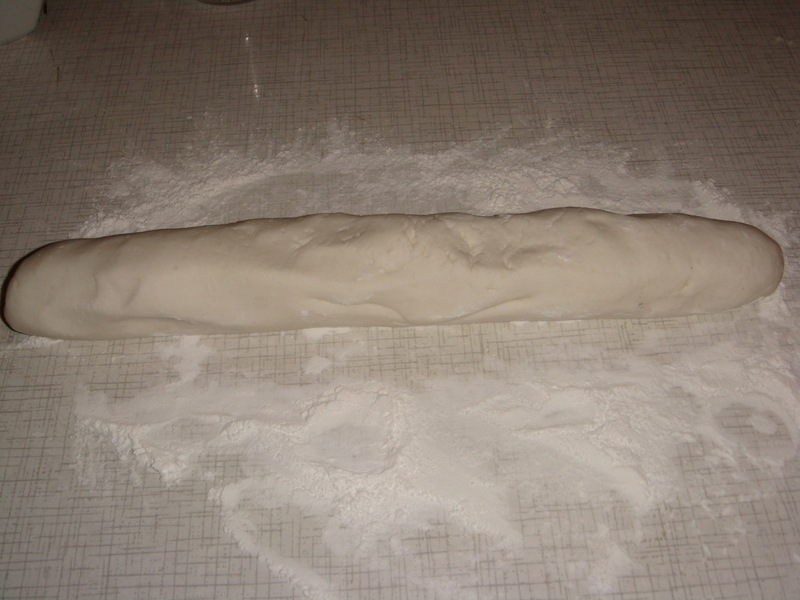 To make a dough, combine the sweet rice flour and salt in a bowl. Add the boiling water one spoonful at a time while stirring constantly. Dough needs to be a cornmeal-like consistency. 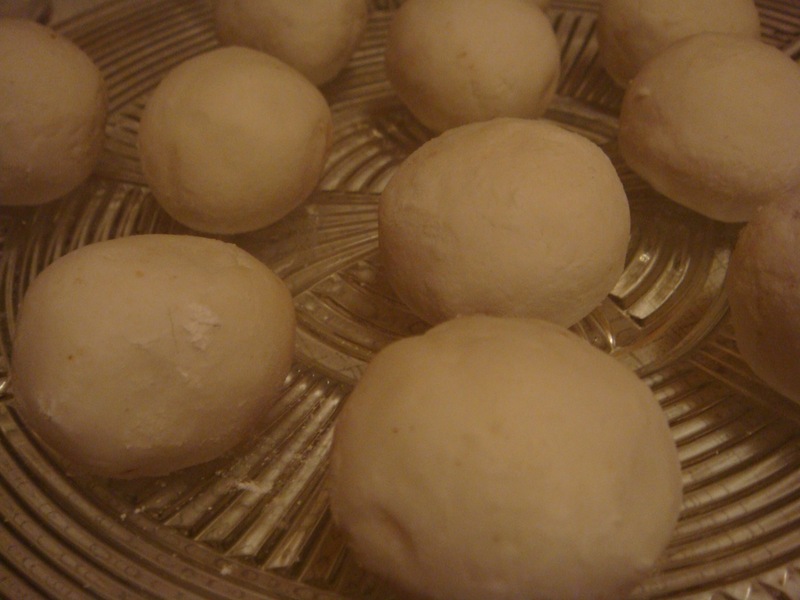 Divide the dough into portions and shape into small balls. 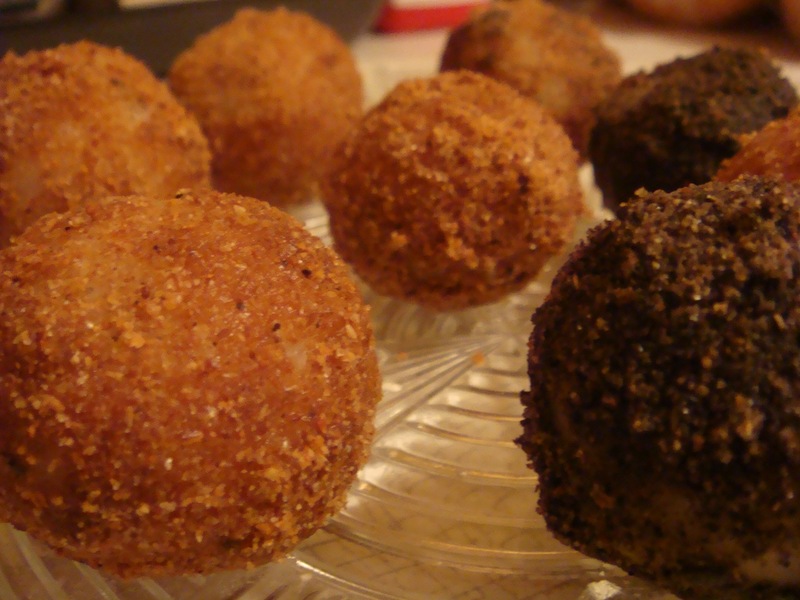 Make a hole in the middle of each ball, put the filling inside and close it tightly. Drop the Kyong-dan balls into the boiling water one by one and boil for about 8 minutes, until they float to the surface. Prepare a large bowl of cold water and plunge the cakes into it. Then place them on paper towels and let them dry for a few minutes. For the final touch, roll the balls in the powders of your choice to coat thoroughly. The sesame seeds powder was a lot of work for me. Each type of seeds I fried on a pan till the moment the got crispy. 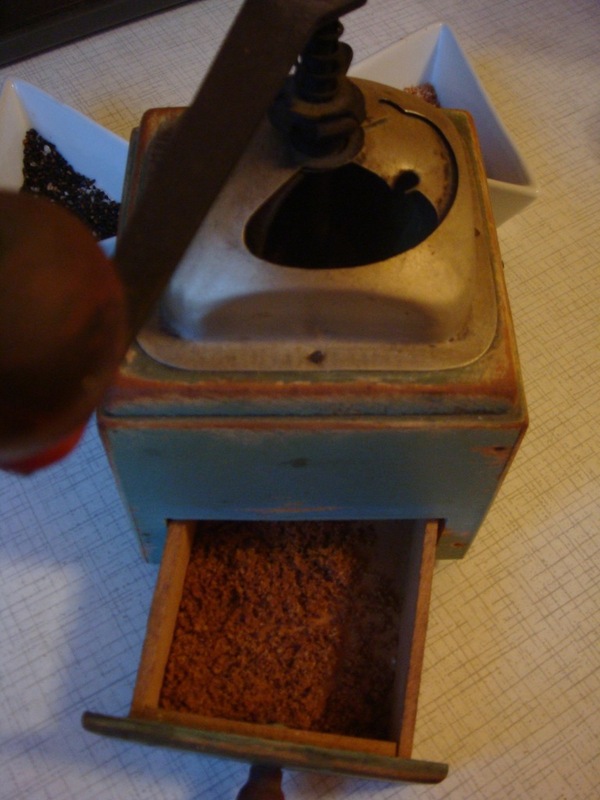 Then I used coffee grinder to grind them, added a tablespoon of sugar and a pinch of salt. You’re probably wondering right now where’s that “a lot of work”? 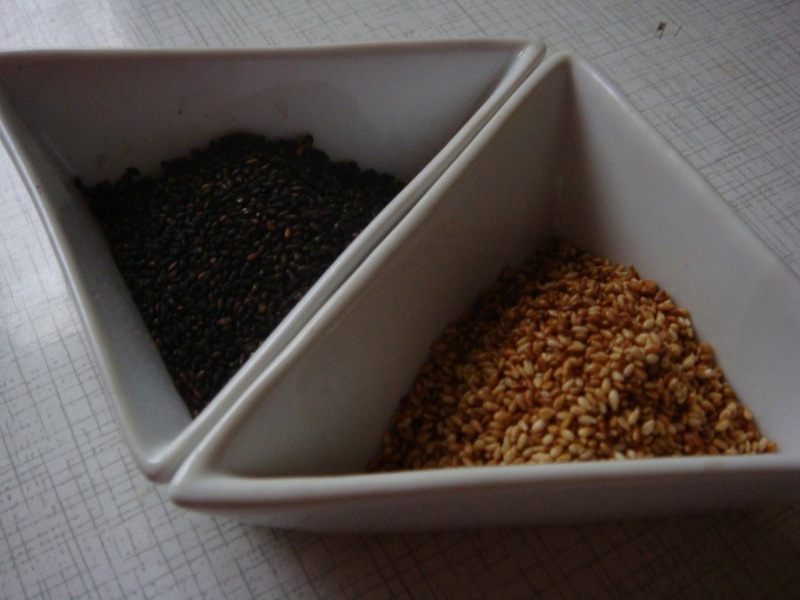 Well, if you have electric coffee grinder, making a sesame seeds powder is a piece of cake. What if the only one you got is 50 years old?